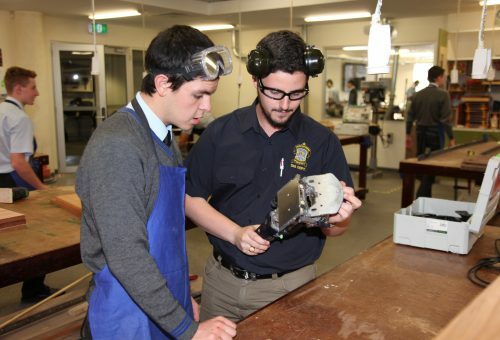 Technological and Applied Studies (TAS) subjects aim to engage students in a diverse range of practical and theoretical activities that provide opportunities for them to solve simple and complex problems. Using innovative and creative approaches, students are challenged to interpret real life scenarios and with the help of modelling and prototyping methodologies, solve problems presented by these scenarios. Students develop critical thinking skills and learn about and use a variety of resources, materials, tools and techniques to solve problems and meet identified needs. TAS utilises a variety of technologies to assist students. The timber workshops provide students with a variety of modern, industry-standard and well maintained machines, and 3D printers are used to prototype and produce a variety of models and components for projects. Students are exposed to and learn to make use of use CAD, video editing and other industry standard software programs. Our computing based courses provide students with the skills and experiences to navigate a technology based world. They are given opportunities to develop a sound understanding of current and emerging technologies so that they are equipped for further education and for life in the workforce – in all industries, not only those traditionally considered to be technology based. In 2015, the TAS faculty moved into the Crichton Building, a dedicated facility with purpose built workshops, design studios and open-plan areas. It was designed from the ground-up to be a dynamic, agile and engaging environment when collaboration and creativity are fostered. Prototyping equipment including 3D printers and a laser cutter. Students undertake various compulsory Work Health and Safety inductions and Safety Testing throughout all practical subjects to comply with legislative requirements.